Over the last month I’ve been asked many times by different clients… How can I lower my sugar intake at breakfast? Read below to find out how and to see some great breakfast recipes. Your blood sugar levels are usually quite low before breakfast as you’ve been fasting over night. In the morning the body can sometimes crave sugary foods however, to keep your blood sugar levels stable avoid high sugary foods such as… cereal, cereal bars, fruit based smoothies etc these are not so good as they can increase blood sugar levels rapidly. Instead, try eating high fibre and higher fat content (healthy fat) foods. This will slow down the release of sugars in to the bloodstream, helping maintain energy levels for a longer period of time throughout the day. Eating foods such as… Eggs, Vegetables, Porridge, Yoghurt, Fish, Avocado, Frittata etc. Smoothie- milk, spinach, protein powder, avocado, flax seed, chia seeds, yoghurt and berries. Fish- salmon, mackerel, anchovies, sardines or herring. (E.g salmon, spinach and scrambled egg on one slice of wholemeal toast). Pancakes made with- banana, oats, milk and eggs. Porridge- protein powder, mixed berries. Its all well and good lowering sugar intake at breakfast but if this means you are going on to eat high sugary foods around lunch and dinner such as cakes, biscuits, chocolate etc then it kind of defeats the point. You should be aiming to keep the high sugar and high bad fat foods at a minimum throughout the day (breakfast, lunch and dinner). All it takes is small changes at a time, start by changing your breakfast from a crappy bowl of cereal to some scrambled egg or a bowl of porridge with fruit. Read the nutritional information on food labels to see how much sugar the food contains. Remember that sugar has many different names. The nearer to the beginning of the ingredient list the sugar is, the more sugar the product contains. Look for the “carbohydrates (of which sugars)” figure in the nutrition label to see how much sugar the product contains for every 100g. More than 22.5g of total sugars per 100g is high. 5g or less of total sugars per 100g is low. 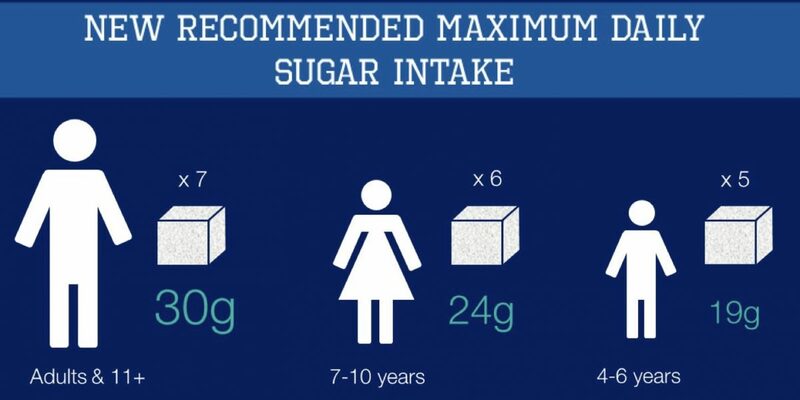 If the amount of sugars per 100g is between these figures, its a medium amount of sugars.